20 And 23 Sea Oak Lane has been added to your favorites! 20 And 23 Sea Oak Lane has been removed from your favorites! This spectacular South Forest Beach home is for those that want the best! This oceanfront compound consists of an 8 bedroom oceanfront home and a two bedroom near ocean private guest house. “Beyond Luxury - Your Own Oceanfront Oasis" is your destination for your family vacation, golf retreat or business get-together. You will start your vacation by entering through a private cul-de-sac where you won’t need to shuffle cars because there is a lot parking. This extraordinary ocean front home was built as a private home for a man selected by Entrepreneur for the “Man of the Year” Award. His eye for exceptional design and quality is obvious in every room. The home has two full laundry rooms, 2 ice machines, 3 refrigerators, 13 TVs, private porches off many of the bedrooms, breathtaking ocean views, commercial Wifi system for access even at the pool, 8 bedroom and a separate nursery, wet bar, lighted raised boardwalk from pool to beach, and the best showers in town. This is the high end home your group has been looking for. From the champagne and martini glasses to the poolside cabana to the wide quiet beach you can feel the luxury in everything you touch. 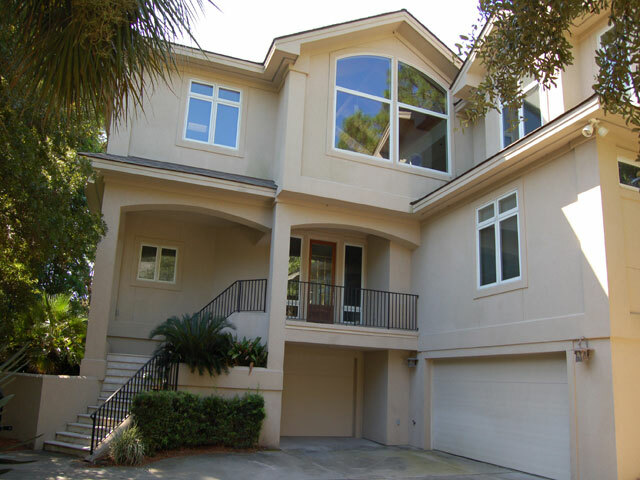 You come to Hilton Head to play and The Beach House at Sea Oak is all set for you. With 3 pools – a large Main Pool with room for floats and toys, a spa and a baby pool. Chill your beverages in the poolside Cabana’s refrigerator, heat up a snack in the microwave or watch the game on the TV. The Poolside Shower Gazebo has hot and cold water and it is soooo nice to shower off after playing in the ocean and then enjoy a cold drink on the deck or in the Cabana or taking a nap on one of the lounge chairs. A fence completely surrounds the back yard providing a safe place for children to play. The beach is wide and quiet and there are no hotels nearby. A 2nd outdoor shower is located beachside; great for washing off your feet, toys or the sand off a "really sandy kid". Although the beach by the house is quiet, you are only 1.1 miles from Coligny Circle – with its large selection of coffee shops, ice cream parlors, grocery stores, causal and fine dining and free entertainment in the summer. 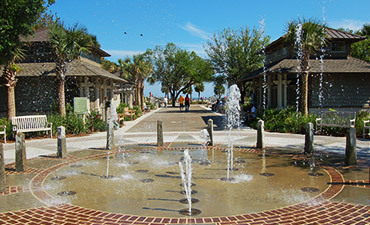 It is an easy stroll up the beach or bike the paved bike path to Coligny Circle. “Let The Games Begin” in the Lower Level near the Cabana there is air hockey, fooz ball, 9 ft shuffle table, and ping pong. New in 2012 is a “gaming media center” with a 55 inch flat TV and all the plugs and game ports you need to hook up your “game gear”. With indoor/outdoor furnishing the group can go from the pool to the game area and back for a quick dip in the pool. We all love great food and the Kitchen with its center island makes it easy for multiple cooks to prepare meals. There is Viking 6 Burner Range w/ Grill, Sub Zero Refrigerator, 2 Asko Dishwashers, a Microwave and lots of pots, pans, dishes and glassware - this is a kitchen which can handle your group. Multiple levels on the island allow children to help cook and makes it easy to set big pots or pan filled with food at a convenient level for your group to serve themselves. The Breakfast bar has a beautiful ocean view or watch the morning news on the TV. This TV swivels for easy viewing from the living room, dining room or breakfast bar. Sharing meals is one of the great pleasures of a family or business vacation and the Beach House at Sea Oak has 3 large dining areas; the Formal Dining Room which has a beautiful glass table with a driftwood base, the 2nd dining room has an extra large oval table (seating 14+) and 2 high chairs or the dine outside on the deck tables. Two gas grills for barbeque aficionados are located on the deck with a bar and bar stools for the cooks and easy access to the kitchen. The Main Floor Media Room has a new 60 inch flat TV, Blu-ray player and access to the House NetFlix Account. The Audio Control Center is located here and allows you to easily play music from your Ipod, computer or other device through the house speakers including the ones in the Cabana and Deck/Poolside. The list goes on but why just read about the Beach House at Sea Oak, come make family memories, visit with old friends and strengthen relationship – we’re waiting for you. The Guest House at Sea Oak is a 2 bedroom/2bath home located across the cul de sac from the Beach Home – no need to drive after happy hour when your second vacation home is here. It is a light and airy home with window on all sides. Wake up watching the squirrels play outside your bedroom window. It has a kitchen, living room, dining room and deck. The living room has two queen futon that can be used for additional bedding. A laundry room is located on the lower level. The perfect place if you need extra space or have members of your group that want to be with the group but also have a place of their own. This home is a separate rental. The Beach House at Sea Oak is “Beyond Luxury” come enjoy. 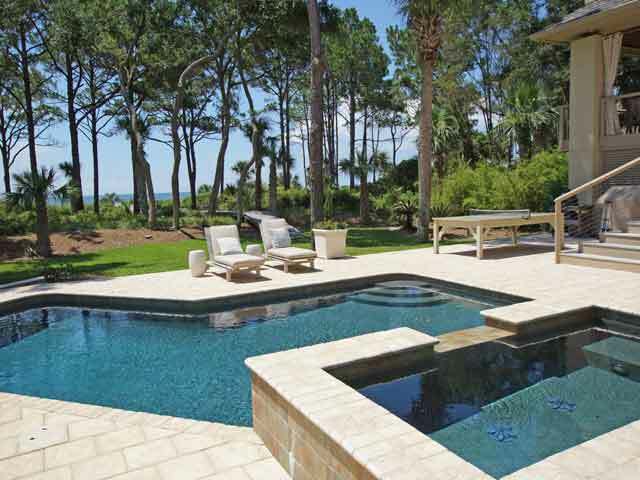 South Forest Beach is located in the highly sought after Forest Beach Hilton Head area. 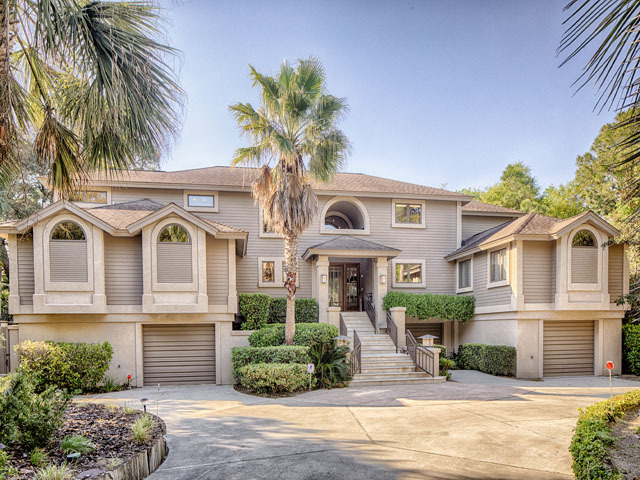 Your vacation experience includes the best of everything Hilton Head Island has to offer, including the glorious natural beauty of the beach as well as convenient shopping, beautiful homes in quiet residential areas.